Banded gneiss with dyke of granite orthogneiss. flat wall rock structures, such as bedding. massive rock formations, usually igneous in origin. 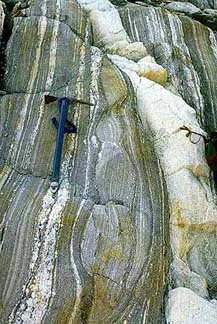 Dikes can therefore be either pushed in between (intrusive) or laid down (sedimentary) in origin. The most usual thing that happens is that later volcanic activity pushes lava through strata which were laid down earlier in a sedimentary fashion, or through earlier igneous rocks. On the Isle of Arran, for example, there are hundreds of igneous dykes giving rise to the term dyke swarm. Alternatively, sedimentary rocks can be laid down in vertical gaps between strata. Or, after underwater earthquakes, gaps caused by the earthquake can be filled in with breccia, that is, broken rocks. Dykes are a common, almost universal, feature of the older Palaeozoic rocks. Another type of intrusion is the sill, where later rock is formed between older layers, not through them. A diabase dyke crosscutting horizontal limestone beds in Arizona. A small dyke on the Baranof Cross-Island Trail, Alaska. This article includes text from the public domain 1911 Encyclopaedia Britannica. This page was last changed on 4 February 2018, at 16:00.